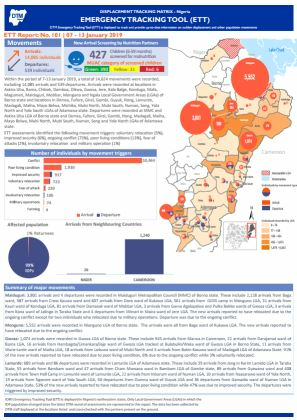 Within the period of 7-13 January 2019, a total of 14,624 movements were recorded, including 14,085 arrivals and 539 departures. 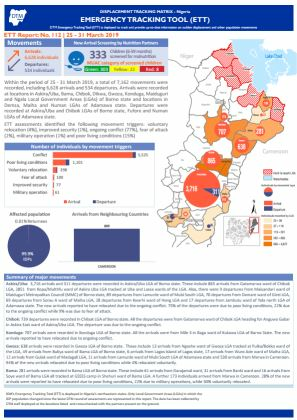 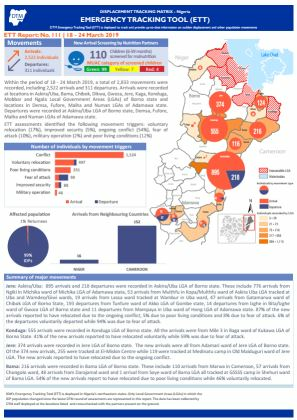 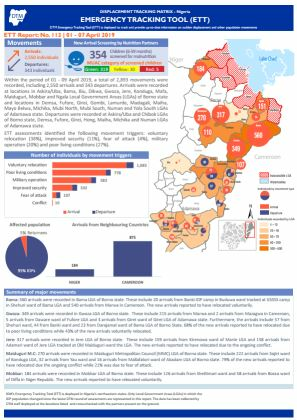 Arrivals were recorded at locations in Askira Uba, Bama, Chibok, Damboa, Dikwa, Gwoza, Jere, Kala Balge, Konduga, Mafa, Magumeri, Maiduguri, Mobbar, Monguno and Ngala Local Government Areas (LGAs) of Borno state and locations in Demsa, Fufore, Girei, Gombi, Guyuk, Hong, Lamurde, Madagali, Maiha, Mayo Belwa, Michika, Mubi North, Mubi South, Numan, Song, Yola North and Yola South LGAs of Adamawa state. 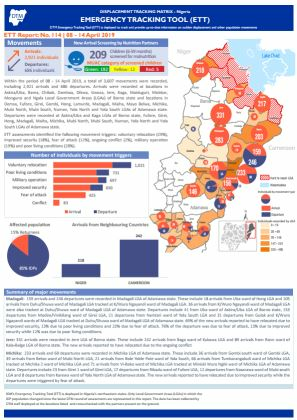 Departures were recorded at MMC and Askira Uba LGA of Borno state and Demsa, Fufore, Girei, Gombi, Hong, Madagali, Maiha, Mayo Belwa, Mubi North, Mubi South, Numan, Song and Yola North LGAs of Adamawa state.